Cloudy. Low 44F. Winds NNW at 15 to 25 mph. Higher wind gusts possible..
Cloudy. Low 44F. Winds NNW at 15 to 25 mph. Higher wind gusts possible. The beef industry, similar to other industries, is constantly attempting to be more efficient and create more value in the product produced. Most cow-calf producers concern themselves with reproductive efficiencies and pounds of weaned calf per acre of land. These two things are important because a cow-calf producer cannot afford to have very many cows fail to wean a calf, and these producers are in the business of selling pounds with a limited quantity of land. Similarly, stocker producers work to reduce morbidity and mortality rates while also trying to pack on as many pounds as possible with their forage and feed resources. Producers from both of these sectors also attempt to add value by instituting management practices that reduce risk to downstream cattle buyers. The feedlot perspective is very similar to stocker operations with focus on feed efficiency and cattle health, but there is also interest in carcass characteristics. Regardless of the marketing method, cattle will be priced based on the actual or expected yield grade (YG 1-5) and quality grade (Prime, Choice, Select, etc.). Quality grade and yield grade are two aspects of beef production that may or may not be considered at the cow-calf and stocker producer levels. There are certainly cow-calf producers who focus on carcass traits when selecting sires and dams, but there are many producers who do not give it the first thought. There are also stocker producers who attempt to purchase cattle based on expected carcass characteristics, but this can be a futile effort in many cases. Whether a producer considers carcass characteristics or not, cow-calf producers and stocker producers influence how cattle grade on the rail. Cow-calf producers choose the genetics that go into the herd. The individual genetics essentially set an upper bound to how an animal can perform from a quality and yield grade standpoint. This upper bound can only be realized if the animal is placed in an environment to promote its genetic potential. Despite what happens at the cow-calf and stocker producer level, feedlot managers will employ management practices in the feedlot to accentuate carcass characteristics. In the past seven years, there has been significant changes in how cattle grade. Figure 1 contains the monthly percentage of cattle grading Choice or Prime in the years 2012, 2015 and 2018. It is fairly easy to see the percentage increase from 2012 to 2015 and again from 2015 to 2018. Moving from 2012 to 2015, the beef cattle market saw 9 percent more cattle grade either Choice or Prime than in 2012. 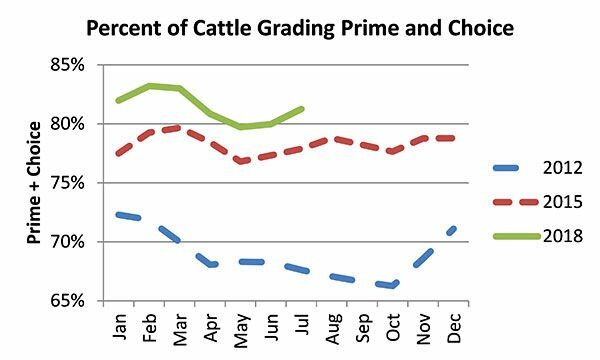 Similarly, so far in 2018, a little over 3 percent more cattle are grading Choice or Prime compared to 2015. There are likely several factors impacting the increased percentage of cattle grading Choice or Prime, and they may include the removal of the beta agonist Zilmax (zilpaterol) from feedlots, carrying cattle to heavier weights and genetic improvements. At the same time feedlot managers are trying to improve quality grade, they have to keep an eye on yield grade. Figure 2 contains the percentage of cattle grading yield grade 1 or 2 for the years 2012, 2015 and 2018. The picture is not as clear cut on yield grade as on quality grade. 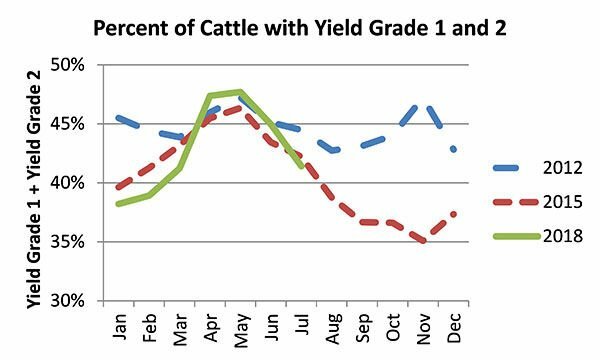 It would appear the percentage of cattle being harvested with a yield grade 1 or 2 declined from 2012 to 2015, with the decline being very apparent in the second half of the year. Alternatively, it is difficult to see much change from 2015 to 2018 in the percentage of cattle harvested at yield grade 1 or 2. The changes in yield grade have likely been influenced by the same factors as quality grade. Cattle that grade Prime or CAB receive premiums, as do cattle that are yield grade 1 or 2. As the percentage of cattle grading prime and CAB increase, it would be natural to see those premiums decline unless the demand for those products increases. The opposite is true for yield grade. The point is that producers should be aware of what is changing in the industry and how it might influence their bottom line.